Dr. Carl Bergmann is pictured here in 1931. He studied plaster molds and experimented with balance wedging. 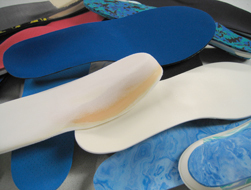 Dr. John Bergmann has been involved in the design of more than 2 million orthotics. Founded in 1939, Bergmann Orthotic Laboratory combines state-of-the-art lab technology with the experience of Dr. John Bergmann, who grew up with orthotics as part of his life. His father and company founder, Dr. Carl Bergmann, took him to the lab as a small boy and had his feet casted for balance orthotics and custom sandals. Later, Dr. John Bergmann worked in every department of the company, gaining further appreciation of the value of orthotics and expertise in materials and quality control. After graduating from Scholl College of Podiatry, he started a practice that specializes in orthotic treatment, which he continues today. He also provides orthotic consultation for practitioners around the country. 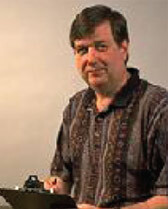 In the early 1980s, Dr. John Bergmann developed the first automated cast correction system. 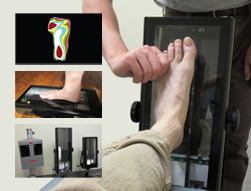 This system uses laser optics and computers to capture the image of a plaster mold of the foot and, with the use of the computer, the image is manipulated to generate a computerized milled wax mold. 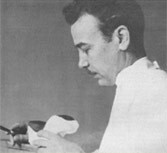 Dr. Bergmann then went on to develop the first optical scanner to replace in-office plaster casting for orthotics. This casting system is rated as the most accurate and versatile casting system available.